This site of mine really “measures up.” Oof! OK, bad puns aside, PrintableRulers.net has dozens of free, ready-made printable rulers. I recently added even more. There are now 80 measuring and drawing tools at site, including new rulers for home, school, work, and hobbies. pocket rulers, a square ruler and many more standard and metric rulers. New to the site are: a meter stick, a yard stick, and a measuring tape to print out and assemble with tape. 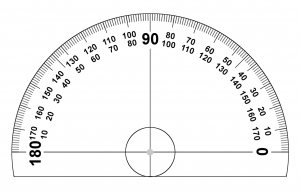 Two new protractors are available in the standard 180 degrees and a full 360 circle. PrintableRulers.net also has several page layout rulers and hobby rulers, plus professional rulers. I’d like to mention one tip: For the most accurate measurements, be sure your printer settings are at 100 percent.